Shakopee coach Jim Jackson has seen it from both sides. After the No. 1-seeded Sabers held off No. 2-seeded Stillwater 35-22 to win their first Class 3A wrestling team championship, it’s safe to say Jackson knows which side he prefers. Jackson won 14 state championships in a record-setting 17-year span at Apple Valley, the last one coming in 2012. 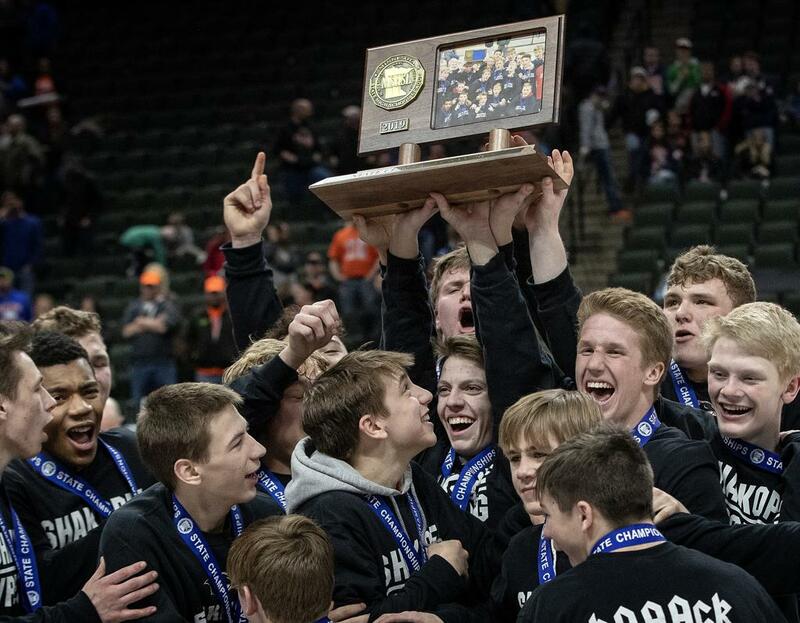 He has also sat in the coach’s chair (stood, actually — Jackson rarely sits during a match) when his team suffered a state tournament loss like last season, when Shakopee was defeated by St. Michael-Albertville in the 3A championship match. So Jackson wasn’t taking any chances this year. His team might have been the 3A favorite, but he was hearing none of it. Looking ahead was strictly forbidden. Shakopee took a 13-0 lead in the final, only to see it evaporate when Stillwater, which entered the match undefeated, won five straight matches to take a 19-13 lead. That’s when the Sabers turned momentum in their favor. Shakopee 160-pounder Connor Raines battled back from an early deficit to beat Antony Tuttle 6-4, cutting the Ponies’ lead to 19-16. Carson Manville, still struggling to overcome compartment syndrome in his left arm, came out with a furious assault at 170 pounds, pinning Hudson Day in only 38 seconds. Shakopee had the lead again at 22-19, and never gave it back. For Shakopee (40-3), the victory was the culmination of a season of dealing with high expectations and bad memories. The Sabers’ loss in the 2018 finals was never far from their minds. While his team shared hugs and high-fives in the wake of the victory, Jackson stood beaming, taking it all in. Shakopee defeated Northfield 48-15 and Bemidji 40-24 to advance to the championship. Stillwater routed Suburban East Conference rival East Ridge 42-17 and slipped past defending champion St. Michael-Albertville 29-20 to reach Thursday’s final. St. Michael-Albertville beat Bemidji 38-24 in the third-place match and Northfield beat East Ridge 40-25 in the consolation final.